Just like engagement rings, when deciding on a wedding band there are lots of styles and designs to choose from. From channel set to micro-grain, it’s easy to become overwhelmed! However, to make this decision a little easier, the first choice you need to make is between a plain or diamond/bejewelled wedding band. There are pros and cons to each side. In this blog post, we’ll go through the main points which will hopefully inform this important decision. The more ‘traditional’ out of the two, this is what many will think of first when it comes to wedding bands. Simple and elegant, it has long stood for the emotional commitment in a marriage. It can be made in a variety of metals, but the most popular is gold. A plain band means it’s less likely to detract from the engagement ring if you plan to wear both. If you have a job that is rough on hands, then a plain wedding band is more practical. Requires less maintenance in comparison to a diamond band. There is less cleaning needed and no stones to chip or crack. 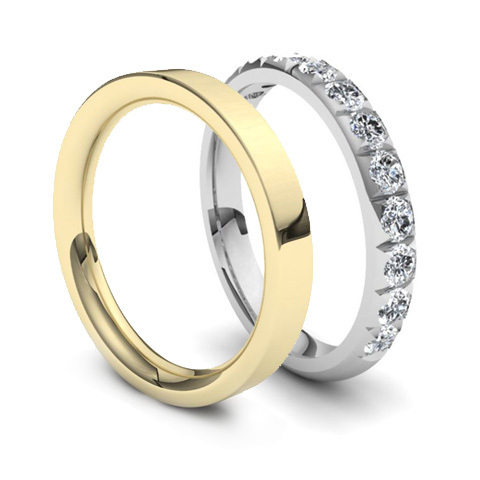 Whilst there are design options available, it’s not as wide compared to a diamond band. A plain band may appear to look worn quicker, as much more metal is on show compared to a diamond set band. If you’re looking for a more modern or unique look, a plain band is unlikely to give you that. Lots more styles and choice. Plenty of options including diamond cuts and settings. A nice in-between of the sparkle and glamour of an engagement ring and a more subtle, traditional feel of a plain band. Gives a more bespoke feel. If you want something more unique to represent you and your marriage than a diamond band is better. Can be overpowering if you plan to wear your engagement ring as well. Extra cost. More diamonds and stones, of course, means a higher price compared to a plain band. More maintenance. Diamonds can attract residue build up underneath, and if not cleaned regularly can loosen and can fall out. So, depending your personal preferences and lifestyles, will determine if a plain band or a diamond band will be more suited to you. If you need any more advice or have any further enquires don’t hesitate to get in touch. We can talk to you on the phone or use the contact form and book a consultation with us. Our knowledgeable staff will guide you through the process and help you with any questions. If you would like to view our collection of bands please visit our collection here.